Black Tea with Coconut, Chocolate & Raspberry, yes please! The rich dark chocolate accentuated with the nostalgic combination of sweet coconut and a dash of zingy raspberry makes this amazing tea, our ode to the old classic raspberry ruffle chocolate bar. 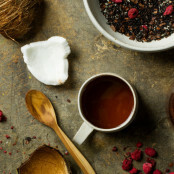 Chocolate, raspberry and coconut… Our latest tea is sure to surprise you! Tasting exactly like the much-loved raspberry ruffle bar (if not better!) you’re sure to feel all nostalgic with every sip. A rich zingy flavour with a sweet, creamy coconutty aroma. The inspiration for this latest creation came from our NPD Manager's favourite childhood memories; days of eating Raspberry Ruffles with her Granny in the back garden, or baking Raspberry Ruffle tray bakes with her Auntie. Alex said that with each sip of this tea, she gets all the nostalgic feels and if she closes her eyes she is taken right back to those happy childhood. Alex is proud of her most recent blend and she can't wait for you to try it! Loose leaf black tea, cocoa shells, coconut flakes, freeze dried raspberry pieces, natural raspberry flavouring. Infuse one tea spoon (2.5g) in 200ml freshly drawn boiled water and brew for 4-6 minutes… It’s your choice next, at Suki HQ we think this tea is delicious made with milk, it gives a real creamy, full-bodied flavour when enjoyed with milk! So for a creamy, chocolatey cuppa add a splash of milk! A fresh and zesty cup. Another brand new taste sensation! Service rating : Excellent service, as always. Product : Not really to my taste. My wife liked it though! Speedy postage and good value for money. Ordered 4 teas and all came undamaged and with some lovely free samples too. Service rating : Although an incorrect tea was sent to me, after I had let them know, they sent me poste haste my ordered tea and said I could keep the other tea. Product : My absolute favourite. Swooningly uplifting rose perfume and chocolate flavours. Service rating : Great service and a very tasty product. 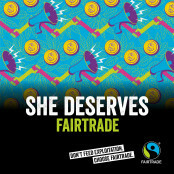 I am looking forward to buying some more.